“The Revival Birdcage”: Revival Cycles presenteert unieke custom motorfiets. Onthulling van de tweede custom motorfiets gebouwd rond het prototype van een nieuw type BMW Motorrad boxermotor. Serieproductie van een motor voor het Cruiser segment wordt voorgesteld in 2020. Munich/Austin. The US American Revival Cycles motorcycle customizers presented their latest creation on Thursday evening, 11 April 2019. The unique bike named “The Revival Birdcage” was based on the prototype of a completely new type of BMW boxer engine. The bike was unveiled at the exclusive Revival Party on eve of the annually held Handbuilt Show in Austin/Texas. The frame of the “Revival Birdcage” is made of titanium and was developed by Revival Cycles itself. “This was our first time to build a frame with titanium, that alone was already a significant challenge”, says Alan Stulberg, head of Revival Cycles. “Regardless, the frame came together very well in the end and we are very pleased with the result as it accomplished the goal of being nearly transparent. We wanted to focus attention on the engine and that is precisely what we achieved with this completely unique frame we designed. 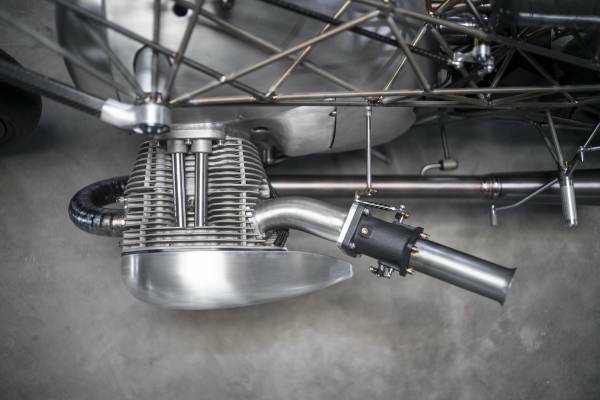 You can easily view the engine and the drivetrain from all angles.” In addition, almost every single other part on the bike such as handlebars, footrests, shift lever, seat and unique carbon suspension components were all individually crafted. Alan Stulberg’s team was inspired by Ernst Hennes’ record-setting machines from the late 1920s and early 1930s. It took around six months to develop the motorcycle. “We had already dreamed about this bike for years and in December 2018 we received the engine and could finally get to work”, says Alan Stulberg. “I have always been a fan of the boxer engine, but the pure physical size and aesthetic appeal of this prototype really inspired us.” The bike was completed in time for the Handbuilt Show in a period of nearly five months.